Tekilux was a name conceived after hearing of LinEx, a Gnu/Linux distribution created for Spain Extremadura province. So I thought that something similar could be done for Jalisco, Mexico. Knowing that Tequila is one most famous drinks from Mexico, and it is a product from Tequila, Jalisco I finally made up the name Tekilux, then it sounds like tequila, but also as technology and it ends with letter 'x' (a must for any Unix like system). I had not done anything like that, but hope to get it done someday. Meanwhile i figured out it was importan to have the domain registered in advance. 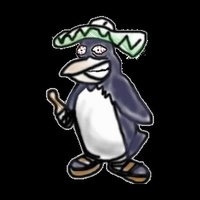 My brother had already created a Tux image with a drunk gaze and wearing poncho and hat.... but i do not know where i saved... probably later i would upload it here.